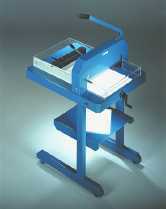 Advanced Document Systems & Supply offers a large selection of Manual Paper Cutters. 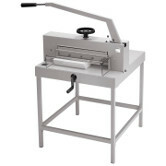 Our heavy duty stack paper cutters are great tools whether you are using them for office or commercial use. Our models include the D842 Heavy Duty Manual Paper Cutter, the D846 Heavy Duty Manual Paper Cutter, the D848 Heavy Duty Manual Paper Cutter, the 4205 16-7/8 Inch Manual Paper Cutter, the 4705 18-3/4 Inch Manual Paper Cutter, and the DocuGem R1800 18" Paper Cutter. 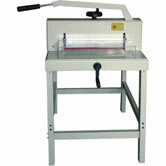 The D series heavy duty manual cutters are great for office and light commercial use. All D-series cutters have the option of adding a floor stand. The 4000 series manual cutters are ideal for heavy cutting up to 2.75" thick! Finally, the DocuGem R1800 is an amazing machine; cutting stacks of up to 800 sheets of 20# paper! 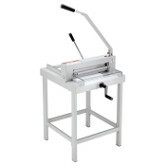 As you can see, we have a Manual Paper Cutter for any of your office or commercial needs. If you have any further inquiries about our machines, check out our Manual Paper Cutters Comparison Table. We also offer a large selection of Paper Cutters, Laminating Machines, Coil Binding, GBC Binding and Tape Binding Machines. Consult with our knowledgeable staff if there is a particular machine or product you require. 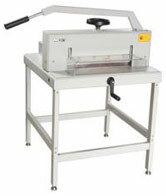 An affordable Manual Stack Cutter, with the capacity to cut 330 sheets. for office and light commercial use. An optional floor stand is available. 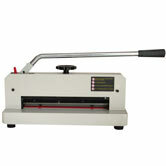 The MBM Triumph 4305 Manual Paper cutter can cut a height of 1 1/2" of paper and a width of 16 7/8". It has saftey features like the Safety Cutting System that has a hinged, transparent safety guard on front table that locks automatically while cutting. lets you cut stacks up to 2 3/4" thick and 18 3/4" wide. 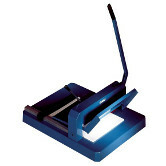 The DocuGem R1800 18 inch paper cutter manually cuts up to 800 sheets of paper at once. 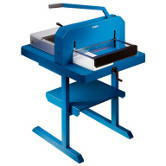 This large format cutter has a sturdy metal constructed base with pre-printed guidelines.